After a poor weekend the previous weekend, I needed to get back out and have some better luck. My father decided he wanted to come along on this trip as well. The trip got off to a poor start immediately, as we left a lot later then I had anticipated or wanted to leave. The original target was Wichita for the night, but it became increasingly apparant on the drive down that I would need to be more north, possibly St. Joseph, MO. We decided to go to Omaha, and stay at Scott Bennett’s house. Adam Lucio and Danny Neal also showed up later on. We had another setback on Wednesday evening. I dropped my laptop about a foot onto some carpet and shattered the LCD, rendering it useless for the rest of my trip. Our target originally was Nebraska City, NE and after lunch we headed down there and met up with Scott, who had gone to work in Lincoln and then headed over after work. We sat around and Rain-X’ed our windshields and got ready for the chase. Cells started firing in central Kansas and then a tornado watch was issued. We dropped south to Auburn, then west to Tecumseh where we dropped south towards Marysville, KS. We made an intercept of the first storm cell that was just west of Marysville, and went north on US 77. The cell fell apart, so we topped our tanks and headed west towards the next cell coming up into Washington County, KS. We made an intercept just south of Steele City, NE and got a little cored with some hail before coming out on the south end of the storm to a beautiful wall cloud. We setup shop on a dirt road and got our cameras on tripods and watched as the wall cloud rotated faster and got closer to the ground. Eventually, as the bowl of the wall cloud wasn’t very far off the ground, we saw a dust swirl underneath for approximately 15-30 seconds. Eventually the rain wrapped around, and I headed east while Danny, Adam and Scott stayed put. I followed the wall cloud down some crummy Kansas back roads before giving up and bailing west to the next cell coming towards Fairbury. 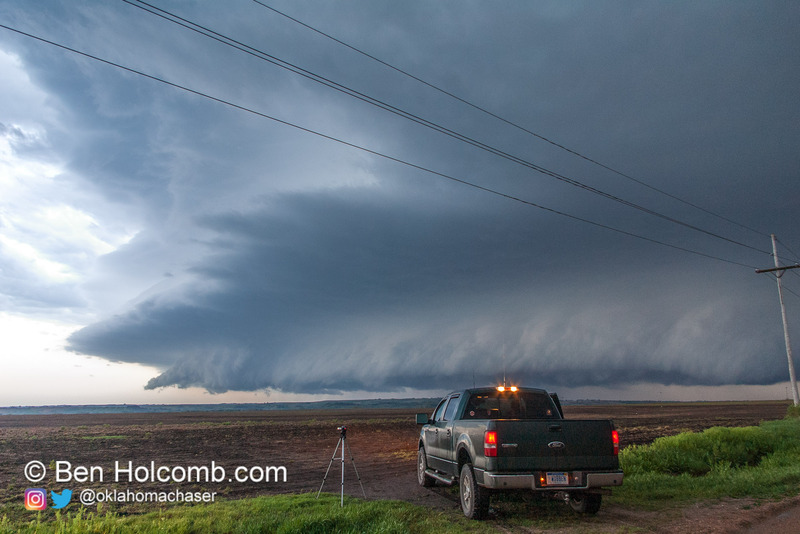 I ended up sitting on a dirt road south of Fairbury, and shot a few structure pictures and taking some incredible shelf cloud footage with my HD camera. I did a phoner with The Weather Channel just as the storm hit me, giving viewers a chance to hear the hail pinging off my truck. We followed the storm back towards Beatrice where it started to actually take on a better presentation on radar. It was once I got to Beatrice that I gave up on it and called it a night. We went to Scott’s office in Lincoln where we got some pizza and edited video, and I did another phoner for The Weather Channel as well. We drove back to Scott’s house in Omaha for the night.